It’s time to pass it over to the wonderful Elle Townsend to show us how to make these delightfully dapper tiffin bites..yummy! 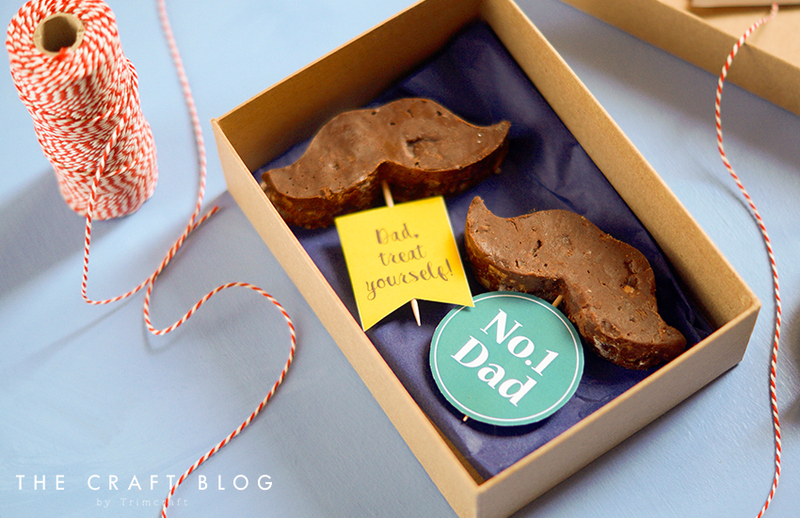 With Father's day just around the corner we're putting our minds to homemade, fun and crafty gift ideas. My Dad's all-time favourite flavour combination is chocolate and peppermint and I almost always buy him a box of Bendicks Bittermints to mark this occasion. However this year, I've decided to go the extra mile and create my own version in the form of chocolate & mint tiffin. For a little extra fun I've created them in the shape of moustaches! 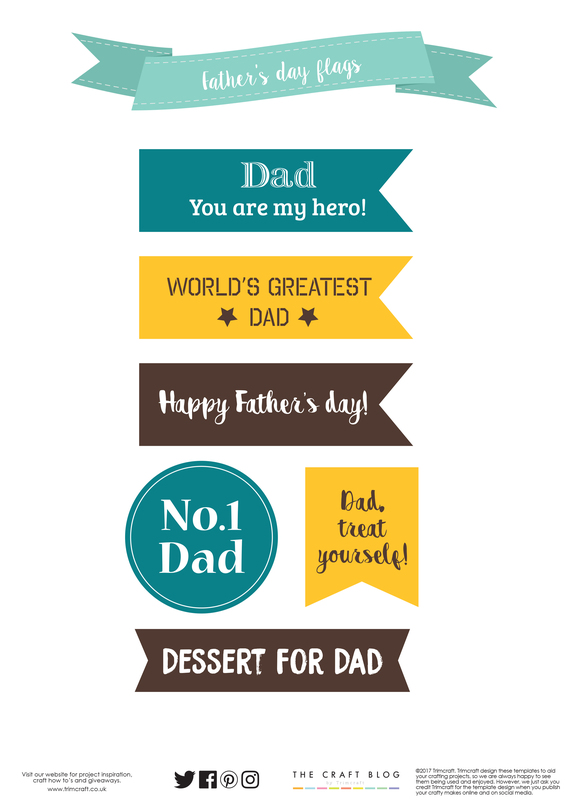 Combine these with Trimcraft’s downloadable Father’s day flags, designed by Cat, and you're sure to put a smile, and a moustache on your Dad's face! 1. Line a rectangular cake tin, roughly 19cm x 24cm and around 3-5 cm deep, with baking parchment. Set a heatproof bowl over a pan of just simmering water and melt together the dark chocolate, milk chocolate, butter and golden syrup. 2. Put the biscuits in a bag and smash them with a rolling pin – aiming for a mixture of small chunks and crumbs. 3. Next place the clear mints into a separate bag, smash these with a rolling pin into small pieces. 4. Once melted mix the chocolate together with the biscuits and mint pieces. Pour into the prepared tin and press down flat with the back of a spoon. For an extra smooth finish, place a sheet of parchment over the top of the mix and press down to the top of the tiffin, peel this off once fully chilled. 5.Put the tray in the fridge for an hour or two. Once set, turn out of the tin and cut into moustache shapes. 6. Firmly insert a cocktail stick into the base of each moustache then stick a flag to the end of each stick using a little double sided tape. These moustaches make a quirky & fun gift either packed into a gift box or simply served as table favours. Mint and chocolate isn't for everyone, so feel free to mix it up and try out your Dad's favourite flavours. A few other options to try instead are ginger biscuits and stem ginger pieces or digestive biscuits and glace cherries. Prepare the biscuits as above then use a knife to cut the ginger or cherries into small pieces before adding to the chocolate mix. If the tiffin mix gets very cold it's quite difficult to cut, so if you're struggling allow the tray to come back to room temperature and it will be much more pliable. If you don't have a moustache cutter and don't have time to go out and find one any shape will work well, squares, rounds or if you're feeling really crafty, you can chill the tiffin mixture for an hour, until firm, but still pliable, then mould into moustache shapes. You can even roll the mix into balls to make truffles. Nice idea for Father's Day, cute cat.